In wood-frame and concrete construction, gypsum concrete is used as a floor underlayment for sound reduction, fire ratings, radiant heating, and floor leveling. Gypsum concrete has a number of advantages including that it’s fire resistant and lightweight. 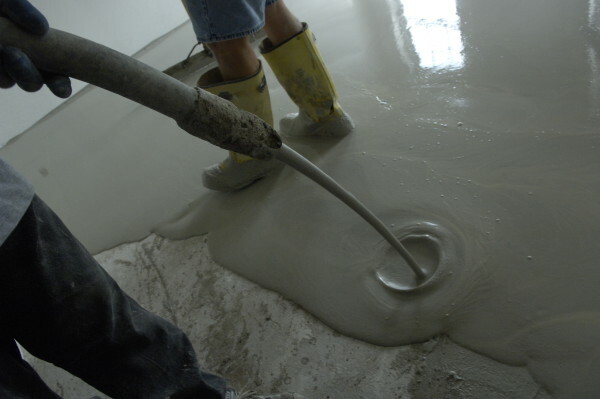 Though it weighs less than the average square foot of regular concrete, it still offers the same compressive strength, and has the ability to be laid faster than regular poured concrete. Kinzler Construction Services employs highly-trained applicators who install gypsum concrete underlayment efficiently and quickly. Depending on layout, up to 30,000 sq. feet can be poured in just one day, with light trade traffic resuming in as little as 24 hours. Expect high quality results every time from Kinzler! Kinzler Construction Services delivers an industry-leading customer experience. Contact us today at 888-292-2382 to learn more and see if gypsum concrete underlayment is the right product for your project. Builders of a Cedar Falls apartment building called on Kinzler to install gypsum concrete underlayment for its excellent fire and sound control.